Although most of the bettas you see for sale are sold in small plastic tubs, these containers are not meant to be your pet's permanent home. There are a number of betta fish tanks sold on the market, and some make a better home for these fish than others. 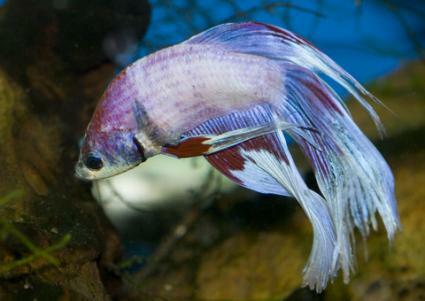 Learn about your betta's care requirements, and then decide which kind of tank you want to buy. In their native Thailand, bettas live in areas like rice paddies where the water is shallow, warm and fairly still. For this reason, many betta enthusiasts feel that a fish bowl provides a suitable environment for their pets. While it's true that a bowl can make a decent home for a betta, it's not the ideal home because it doesn't provide much room to swim, and it's difficult to keep the temperature constant. If you choose to keep your betta in a bowl, make sure it holds at least one gallon of water, and preferably more. Keep the bowl in an area where it won't be subject to drafts or direct sunlight, and be prepared to clean out the bowl and add fresh, dechlorinated water two to three times a week. You'll also need to add some sort of lid to keep your pet from jumping out. When it comes to maintaining a stable environment for you betta, a tank with a filtration system is a better choice than a bowl. Here's what you'll need. Tank size: The ideal size tank for a single betta is three to five gallons. Filtration system: Underground filters can help keep your betta's tank clean, but a lot of waste gets trapped in the gravel and makes clean up difficult. Many enthusiasts prefer to use a Bio Wheel filter. Gravel isn't necessary with this type of filter system, although you can add a thin layer if you like, and it's easier to use a suction hose to draw out waste from the bottom of the tank. Heater and thermometer: You'll need a heater and thermometer in order to keep the tank temperature around 80 degrees Fahrenheit. When you eliminate temperature fluctuations, you lessen the stress on your betta. Tank hood: Bettas are known to jump from their tanks, so it's necessary to have a hood to cover your tank. You can purchase a mesh hood, but it's actually better to purchase a regular tank hood with a built in light so you can see your fish better. Plants and ornaments: While these items aren't completely necessary, they do add interest to the tank and enrich your betta's environment by giving him places to explore. Bettas also appreciate have places where they can hide sometimes and sleep, so keep this in mind when you choose your fish tank decorations. Don't overcrowd the tank; a couple of plants and a few rocks are sufficient. Just remember that you should only use items specifically made for use in fish tanks or that are safe for fish tanks. If you prefer to purchase your betta's home in a package rather than gather all the components yourself, a number of companies offer tank kits that make good homes for bettas. Here are a few samples of what is available, and you should be able to find these tanks and more at your local aquarium supply store. Make sure you understand exactly what each kit contains in case you need to purchase one or two items separately. Providing your betta with a great home will help keep him healthy. Choose the nicest tank set up you can afford, and make sure you keep the tank clean by performing regular water changes. Think of your pet's aquarium as an investment in his welfare. A good tank will last through several betta's lifetimes.